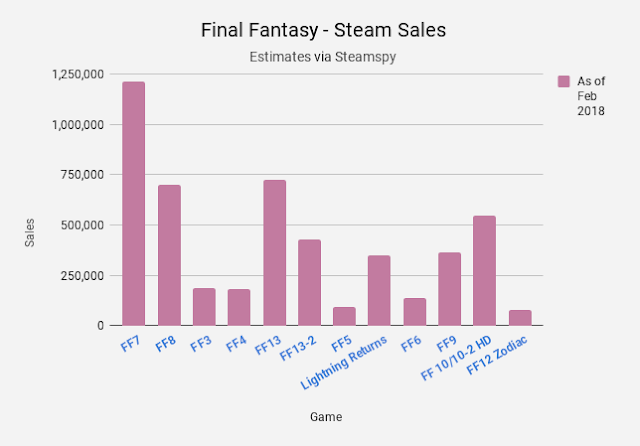 Home Final Fantasy Sales Insights How Have the Final Fantasy Games Sold on Steam? 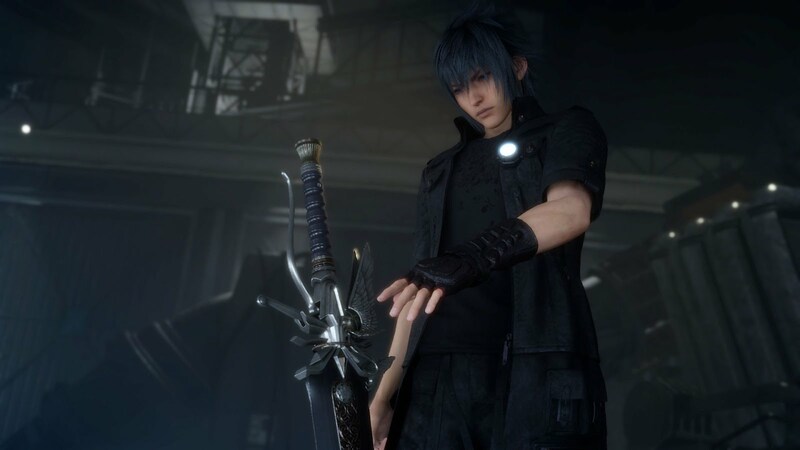 Tabata mentions that Final Fantasy XV has sold approximately 7 million units on consoles so far, and that the team hopes the game's PC release will add another 2 million units or so to that count. The question is: how realistic is that expectation? As it would turn out, it's actually quite realistic. The chart above displays a list of the numbered, singleplayer Final Fantasy games that have been released on Steam along with sales estimates from Steamspy as of February 2018. They're listed in the order of their Steam release. As you can see in the chart, Final Fantasy VII is the highest-selling Final Fantasy on Steam so far. It has managed to sell 1.2 million units to-date, almost assuredly aided by the fact that it is by far the most well-known, most historic Final Fantasy game ever released. The Steam version of Final Fantasy VII was released in February 2013—well over a decade after its original release—and it has managed the 1.2 million figure over a period of five years. Meanwhile, Final Fantasy XIII, a more recent game, has sold around 725,000 units to-date. This game was released in October 2014, four years after its console release, and famously has a reputation for being among the not-so-well-received Final Fantasy titles. Despite this, it has managed to move a respectable number of units over the course of three years. This brings us to Final Fantasy XV. Given that Final Fantasy XV is being released on PC just two years after its console debut, has a much better reputation than Final Fantasy XIII does, and is still being supported with downloadable content and expansions by Square Enix, the game achieving 2 million in sales over the course of of a couple of years seems very probable. For perspective, exact figures for all the Final Fantasy games in the chart above are listed below, alongside their release dates. One notices a pattern wherein the PlayStation 1 and PlayStation 2-era games—that is, the 3D Final Fantasy games with Tetsuya Nomura's character design work—are unsurprisingly the most popular. This is a characteristic that will undoubtedly benefit Final Fantasy XV as well. That having been said, keep in mind that Square Enix didn't really make a concerted effort to place Final Fantasy games on PC until 2013, which explains why PC sales on the whole might appear lower than expected. The franchise is still finding its audience on the platform and Final Fantasy XV will play a major role in this process. Note: All data sourced from Steamspy. Data does not include error margins.